Colorado saw its first Amish communities in the early 1900s. Amish have never had a significant presence in the state, however. But a recent wave of settlement may change that. As of 2010, the state was home to 4 Amish communities (Young Center 2010). Population pressures in heavily-settled eastern communities have long caused Amish to seek new opportunities to cheaply acquire farmland. Outside of their homelands in Pennsylvania, Amish have found prime areas for settlement in the Midwest and have also settled in the South (Tennessee, Kentucky) and North (Maine, New York, Ontario). Western states first attracted settlement in the 1800s, with Amish communities since founded–and later disbanded–in states including Arizona, New Mexico, and Oregon (Settlements That Failed, David Luthy). Over the past decade, Amish have moved into Colorado from both East and West, from communities in states such as Missouri, Montana, and Ohio. The Amish in Colorado have focused settlement in the San Luis Valley in Southern Colorado, described as “roughly the size of Connecticut” in a Denver Post piece on the communities. Most Amish settlers to Colorado have found farming conditions different from wetter eastern areas, however. Small business has helped to supplement farming, with Amish involved in furniture making, beekeeping, greenhouses, dog breeding, and tack, among other occupations (“Amish settle in Colorado’s San Luis Valley, diversifying to support families”, Ann Schrader, The Denver Post, August 15, 2010). Read more here about Amish furniture in Colorado. 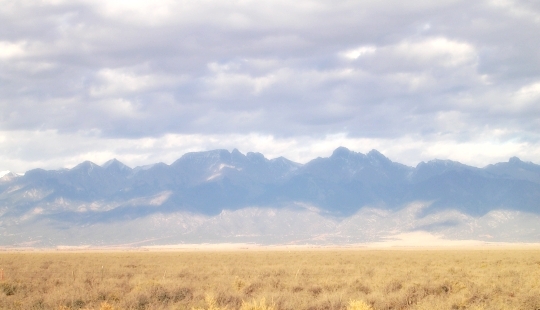 Colorado’s largest and oldest community is found at Monte Vista in Rio Grande County. Founded in 2002, the Monte Vista settlement today numbers 2 church districts. Settler Magdalena Troyer described the attraction which inspired the move from her Missouri Amish community to the Centennial State: “We had been wanting a little more room, a change in the environment”…”There was a pull to move to the wild West, I guess you’d call it” (Denver Post). The Monte Vista settlement numbered about 30 families as of 2010. Other communities are seen at La Jara in Conejos County–also described as the Manassa/Romeo community. This settlement counted 18 families in 2010. Like Amish elsewhere in Colorado, those in Conejos County derive income from a variety of sources. Some even do piecework for a luxury bootmaker whose product is shipped to Japan and Germany (Denver Post). The settlement at Westcliffe in Custer County was founded in 2008, and had reached a size of 10 households two years later (Denver Post). The community’s founding can be traced to horse trainer Enos Yoder, formerly of the Bloomfield, Iowa Amish settlement. According to a 2010 LA Times piece on the community, Yoder had originally visited the area to deliver horses, and “couldn’t get the isolated, unspoiled beauty out of his head.” A few years later, he moved his family to the area (“Westward ho for Amish”, Los Angeles Times, Jenny Deam, June 1, 2010). Colorado has gotten a spell of recent attention as a number of new Amish settlements have been founded by Amish mainly from the East. Interestingly, a similar phenomenon occurred around 100 years ago when Amish founded three Colorado settlements within 2 years. For various reasons none of these communities lasted much longer than a decade. Though it is likely scattered Amish may have lived in the state prior to formally founding a commmunity, the first bona fide Colorado Amish settlement was founded in Elbert County in 1909 near the town of Limon (itself in Lincoln County) (The Amish in America: Settlements that Failed 1840-1960, David Luthy). David Luthy reports that over the years of its existence, the Limon settlement struggled with church dissension and lack of ministry, with the community’s Amish writing letters to the Sugarcreek Budget entreating other ministers to visit to hold church. Services were sporadic and communion was not held for much of the existence of the settlement. Some Amish from this community ended up becoming part of a Mennonite congregation, while the last Amish had left by 1920 (Settlements that Failed, pp. 49-55). A second settlement, and the shortest lived of the three, was started in 1909 near the town of Wild Horse in Cheyenne County. “Colorado fever” had struck Amish in existing settlements in places such as North Dakota and Oklahoma, and Amish began arriving by the train car-load, with at least 30 settlers and their families coming to live in the eastern Colorado county. Unfortunately, the Wild Horse Amish faced a number of challenges including drought, prairie fires, wind and hail storms, and disease. Soon after the settlement was founded, Amish were already moving away–even as newcomers continued to arrive. The last Amish household had folded and left by 1914. Luthy speculates that “Perhaps no other Amish settlement grew so quickly and died so soon as Wild Horse, Colorado.” (Settlements that Failed, pp. 55-59). The third settlement, that near Ordway in Crowley County, was originally intended to be be located near a town named Dayton. Dayton is today remembered as a “dream town”–a planned settlement organized and promoted by land agents but which never materialized. Luthy notes that due to the influx of Amish into nearby Cheyenne and Ebert Conties, land agents decided to target Amish as well. In contrast to those settlements, however, the Ordway area was well-irrigated and more promising in terms of the range of crops which could be grown, as the area supported a variety of fruit trees and vegetables. Luthy explains that in operating their farms “it was common for the Ordway settlement to get seasonal workers from other Amish settlements, especially the group living near Wild Horse”. Alfalfa, sugar beets, and cantaloupes were among the cash crops grown by Amish. Over time the settlement dwindled and by 1917 had ceased to exist, due to two problems: irregular irrigation, and typhoid fever (Settlements that Failed, pp. 59-65). To read more, try this article on the Ordway Colorado Amish settlement. The early Amish settlements in Colorado all failed soon after founding. Will today’s Colorado Amish communities suffer the same fate? Amish churches are subject to a number of pressures including financial pressures, lack of ministry, and religious differences. The area which today’s Colorado Amish pioneers have been settling in, the San Luis Valley, is known to be an economically depressed region. Additionally, farming is not such an immediately viable option, with only a fraction of the rain as received in most eastern Amish settlements. However, with improved technology, and the rise of alternative occupations such as small business and working for non-Amish employers more common, Amish in Colorado’s San Luis Valley may have a better shot of surviving than their predecessors from a century ago. Only time will tell. I am interested in learning more about the Amish people, your beliefs, and the possibility of visiting or even living in one of your communities. I am looking for a pure, simple, peaceful way of life. My phone number is 1-719-221-0226. I am presently in South Fork, Co.
May God’s greatest blessings be present in every aspect of your lives. I beg to differ, as Mark from Holmes Co. IS Amish and DOES use the internet! And so am I.Old-order Amish and use internet. Kiki is right. There are Amish groups who would never think of using a computer, some who have smart-phones and a lot of variety in-between. I do not have a computer at home or a cell phone, but I work in an office most of the time and I do use the internet while I am at work. (I spend a fair chunk of my day seeing to business emails. My work-place is not Amish owned, if it was, there would be no internet) as well as using the computer at our local library, where you can often find Amish folks on-line for some reason or another. I often see Amish folks at the local library ordering things online or looking things up. For a cabin check with ProShed. They can do quality building to your specs and size. Call 719-852-4800 and ask for Edwin or Timothy. Anyways, I suppose my reason for this is that I am quite intrigued as to the way of living that ya’ll have chosen. Though I don’t expect a responce I will most likly cheak back in roughly a month. I live between the Monte Vista and Manassa communties and have met some of these folks. I was lucky to find that one family was cousin to a family I knew in Holmes County! I live in Colorado and only knew about the settlements in the valley, so thanks for educating me. We have been wanting a good weekend to go down there and visit. Very interesting reading! Thanks, Erik! Our farm is located in Hanover, not Colorado Springs, CO.We have a 600 acres for sale in 3 lots: 160 acres which is irrigated with a pivot and a side roll, has 3 homes, huge hay barn, horse barn, garage,7 stall loafing shed, silo, etc. We also have 280 acres with water and one 160 acre (no water) next to it, those 2 lots are about 3 miles from this home. We live on a dead end road, which is gravel, and Chico Basin Ranch and their 100,000 acre ranch is across the street. There is no building of homes allowed. We are asking $1,2M firm which includes all the farm equipment. Please contact me for further information or to arrange for a visit. I saw somewhere that there is a small population of Amish in Yoder, Colorado, just East of Colorado Springs. Where can I find out more info about the community. I just visited Amish communities in Ohio when I was back ther visiting relatives for Aunts 100th birthday. I love the people. They are so sweet and gracious. I’d like to visit the Amish in Colorado. Is that possible? Anyone know where exactly, they reside in the state? I heard that there is an Amish comunity East of Colorado Springs called Yoder. Not sure cause I haven’t had chance to get over there. I am interested in finding out if there are any builders that would be willing to build a custom home in about 5 years. Please feel free to mail me information on how to contact a builder. I am interested in what it entails. My husband and I have been very determined to make our dream home possible and we desire the quality craftsmanship that the Amish can provide. Thank you. I am looking for the dates for the Amish School Auction in Monte Vista. Deena, it seems that the 7th Annual Monte Vista Amish School Consignment Auction was held Saturday, June 6, presumably 2015. I am looking for an Amish community that has a buggy shop. I have an Amish buggy that needs wheel repair. I’m sorry, I’m looking for this as close to Denver, CO as possible. Zach, below are two links with information in the U.S., but only some are Amish. If you would contact Wana Wheels, maybe they would know of someone closer to you. I’m an Orthodox Christian and am so fascinated by the Amish lifestyle; I love doing things the old ways. My husband and I will be moving to southern Oregon and wondered if the Amish in CO use the horse and buggy to get around there. I wanted to learn to use a mule and buggy but it’s difficult in OR where the roads have no shoulders. How do the Amish deal with road conditions like this and is CO more difficult than the eastern states in this matter? Thanks and God continue to bless and keep you all! Kiki yes the Amish communities listed above all use the horse and buggy (they are considered Old Order). On roads with no shoulders, buggies simply ride on the road. I am assisting a senior finish a modular house that needs decks, balconies, and interior carpentry as well as the construction of a garage and utility room connecting the house to the garage. The property has an existing house that can be lived in while the work on the new house progresses. However, the existing house needs internal and external repair work before it can be used for temporary housing. The older gentleman I am helping has high quality standards for carpentry work and has been discouraged by the lack of skilled craftsmen in the marketplace today. If anyone is interested, please call me at 719.546.0761 or 719.240.4637 Cell.